I'm sure many of you thought I was going to post about the fine art of crisped bread, warmed and slathered with butter and jam (which, yes, I actually am quite the expert on). 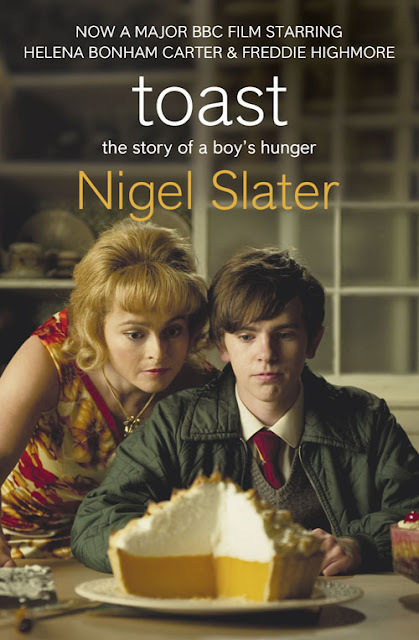 In this case, Toast is a delightfully quirky film about Nigel Slater, the famous cookery writer, and his lonely childhood as he seeks comfort in food. Being on this side of the pond, and not much into cooking shows, memoirs, and the like, I shamefully admit that I was completely unaware of Mr. Slater, so I was simply swept away in a whimsical film starring Helena Bonham Carter, one of my favorite actresses. 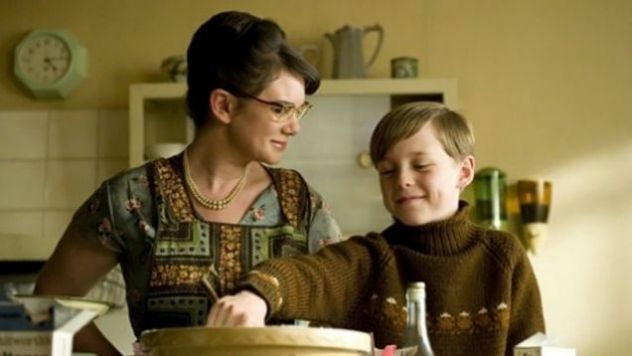 Set in the 1960s, this imaginatively filmed story explains the very foundation for why Nigel Slater fell in love with cooking. When Nigel's mother passes away, neither Nigel or his father turn to each other for comfort. The way to a man's heart is through his stomach. Truer words could not have been spoken for Joan Potter, played by Helena Bonham Carter, as she sashays her way into their lives, brilliantly cleaning and cooking, leaving her own unhappy life behind. Unfortunately, she is severely lacking in warmth, or even compassion, for the young boy who becomes her stepson, and although young Nigel is enamored with food and recipes and delectably edible creations (to the point that looking at cookbooks under the covers late at night with a flashlight instead of a risque magazine is the norm for him) he and his new stepmom never see eye to eye. Instead, their mutual love of food and what it can do to win the notice and affection of Nigel's father is the center of it all, and the competition begins to heat up. Nigel's love affair with food continues throughout his young life, and when he decides to take Home Economics instead of Shop class in high school, he flourishes even more. Now, though, the competitiveness becomes a tangible thing between Nigel and his stepmother, as now Nigel understands the basics and the science of cooking good food. Can Nigel win his father's attention? Or will Joan maintain the sole adoration? When the battle comes down to lemon meringue pie, it is deliciously heartbreaking. Though the film pops of humor, it's actually a very sad story. Nigel's memoir clearly translates well, and beautifully, to the big screen. This is not, though, a film for those who prefer a lot of movement and fast-pacing; instead, this is for those who are prepared to enjoy a slowly told, illusory and offbeat tale centered around food. With its brilliant moments of dark, sad humor, swirled around recipes and the 1960s, it's a film I'll watch again, and soon. The visual appeal of the time is wonderful and represented well with its soft hues, and there are some seriously heart-wrenching moments of contradiction as Nigel's father dismisses everything his young son tries to make, yet raves over everything Mrs. Potter throws together. I wanted to reach into the story and beg his father to notice his son, just once, to take note of Nigel's wonderful attempts to try, to make spaghetti bolognese, if only just to please his father. Without question, Helena Bonham Carter is perfectly cast as the chain-smoking woman from the wrong side of the tracks who is hired as the family's housekeeper after the mother passes away, and who seductively wedges her way into their lives. Oscar Kennedy as the nine-year-old Nigel is unbelievably good and I can't wait to see how his career evolves. Freddie Highmore as the teenage Nigel knocks it out of the park, and I've just realized he was in the film Finding Neverland. Ken Stott as Nigel's father is *it,* he is the right guy for this role. Well cast, filmed, and directed. Loved this movie. Clearly, I now need to read all of Nigel Slater's books. Weekend Cooking is a weekly meme hosted by Beth Fish Reads. It is open to anyone who has any kind of food-related post to share: Book (novel, nonfiction) reviews, cookbook reviews, movie reviews, recipes, random thoughts, gadgets, quotations, photographs. If your post is even vaguely foodie, grab the button and link up anytime. You do not have to post on the weekend. Click here to see more of this week's participants. 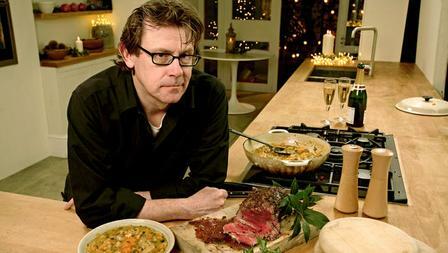 Nigel Slater Image Credit from the BBC. Hm, this sounds like something both Carl and I might enjoy. I wonder if it's on Netflix streaming. I like the sound of this one, and since it's kind of a foodie movie, I am sure that I would really like it. It does sound sad though, and very realistic. I would love to watch this one, or perhaps read the book. Very nice review today, Natalie! So hilarious that you put my name in your comment, Bermudaonion, as that is EXACTLY the kind of film I love. I will be tracking this one down at some point as it sounds so good and the pictures you included in your review sold me as well. I've long been a fan of Helena Bonham Carter and this will be a nice one to watch as an antidote to all the Burtonesque roles she has played, and played well, of late. This sounds like such a good film - I'm definitely jotting down the title of it. I'm also going to be looking up Slater, too. I'm so glad you posted about this film or I don't think I would have heard of it - thanks! By the by, I love Helena Bonham Carter - she rocks! I just read this book before Christmas and loved it ... Nigel is such an interesting man ... and has made such a success of himself,given his quirky past. Still, it does look like a cute movie, although sad, too. I didn't realise this had been made into a film. I love Nigel Slater's cookery so will watch this as soon as I can. Thanks for drawing it to my attenion! I don't like lemon meringue pie, either, but think I would love this movie except for feeling bad for Nigel's situation. The movie looks so good! I'd be interested in seeing it! Thanks for posting all those pictures. Sounds great! And I admire that amazing pie on the movie poster. Sounds wonderful...this is my kind of film! Oooh, thanks for the recommendation, this film sounds wonderful. Lovely review. This sounds great! I've added it to my DVD cue and the book to my WishList. His other books look really interesting as well. Loved your review! I haven't seen this film but am now adding it to my To Watch list. I agree, Helena Bonham Carter is fabulous. Thanks for sharing your review! I'm so glad you got a chance to see this. I really liked it too. This looks gorgeous. I had not heard of it yet - I'll have to try streaming it one day soon. I love the 60's vibe from the stills. What a wonderful review, you really made me want to see this movie. I'm not familiar with the man or his books, but I really want to see the film. Awesome review. Read the book and now I must seek out the movie. Thank you for the review. I like Nigel Slater but would probably not have watched the movie if not for your review. It sounds charming! never hard of this one...looks very cute. I came across this movie some time ago quite by accident and loved it. I agree, Helena Bonham Carter is perfect for the role of the stepmother. I love his writing but I have never heard of this! Looks wonderful! Bonham was, indeed, her quirky over the top self and the film did do justice to the family dynamic from the book , but did I miss something? I thought they made their peace after the father's death ... and Nigel beat feet for greener pastures ... regardless, I loved both the book and the movie. And was gratified that Slater made the cameo in the last few scenes when young Nigel goes into the kitchen in London for his first real gig in the restaurant kitchen ... loved it!